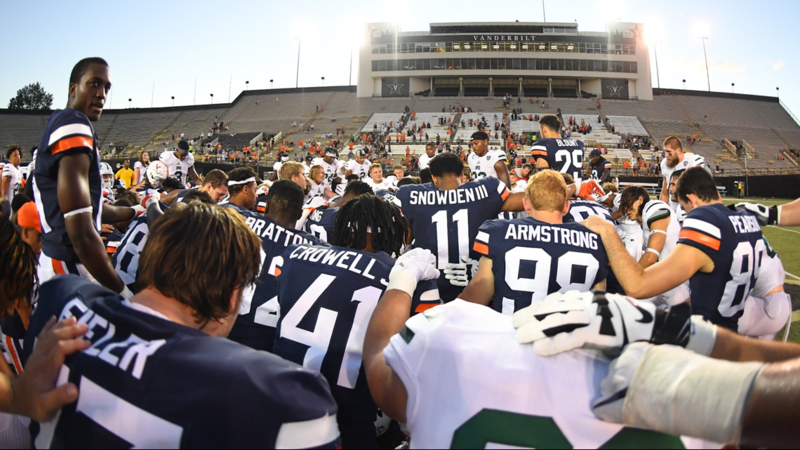 NASHVILLE, Tenn. (AP) — Virginia coach Bronco Mendenhall called the whole situation surrounding Saturday's game against Ohio "weird." 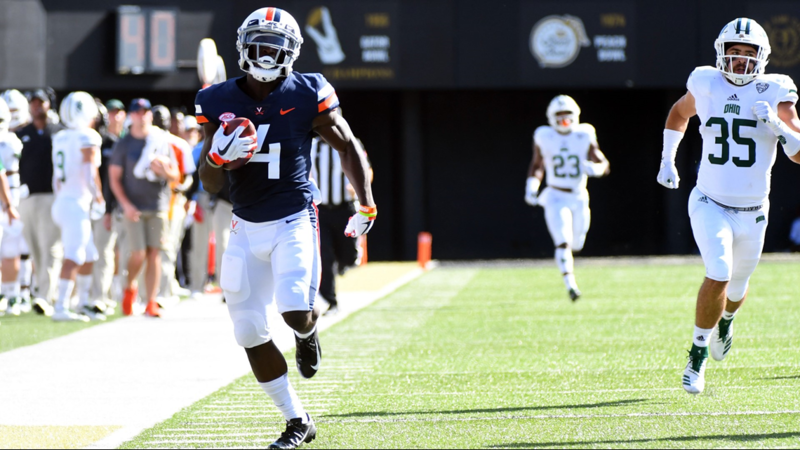 Despite the obstacles and weirdness Hurricane Florence created for his team, Mendenhall will gladly take the 45-31 victory. After all, it isn't normal to travel 545 miles from Charlottesville, Va., to Nashville to play a "home" game. But that was the situation created when it was decided Tuesday afternoon to move the game. 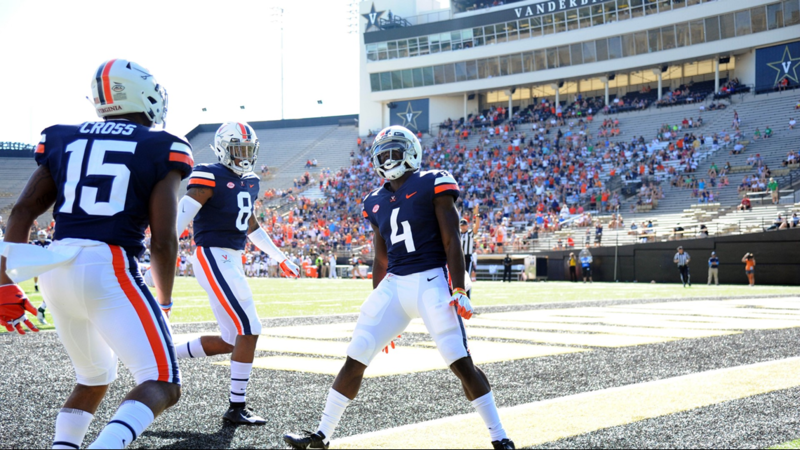 "The whole thing is weird," Mendenhall said. "Not knowing whether we were going to play was weird, not knowing where we were going to play was weird. Coming a day early and changing hotels twice, and then showing up to an empty stadium that we have no affiliation with, the whole thing was weird." The Cavaliers (2-1) made the best of the situation, especially in the first half, rolling up 38 points, to claim the victory jin front of an announced crowd of 5,438 fans, all admitted free of charge. 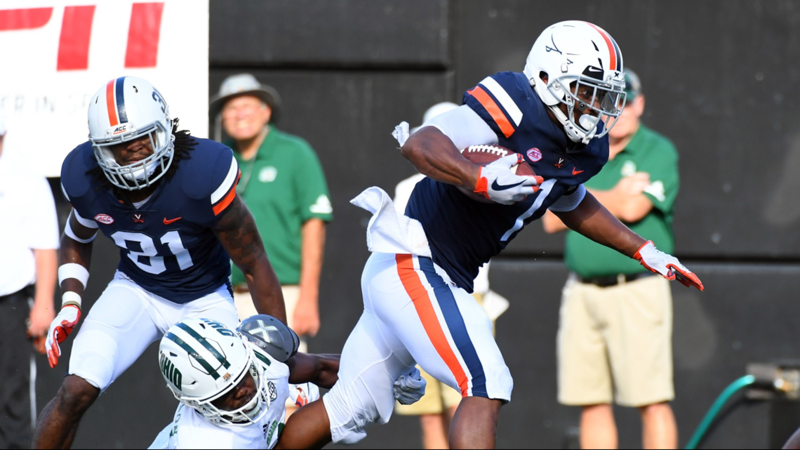 Virginia's Jordan Ellis rushed for 171 yards and three touchdowns in the first half, and wide receiver Olamide Zaccheaus set a school record, catching nine passes for 247 yards. 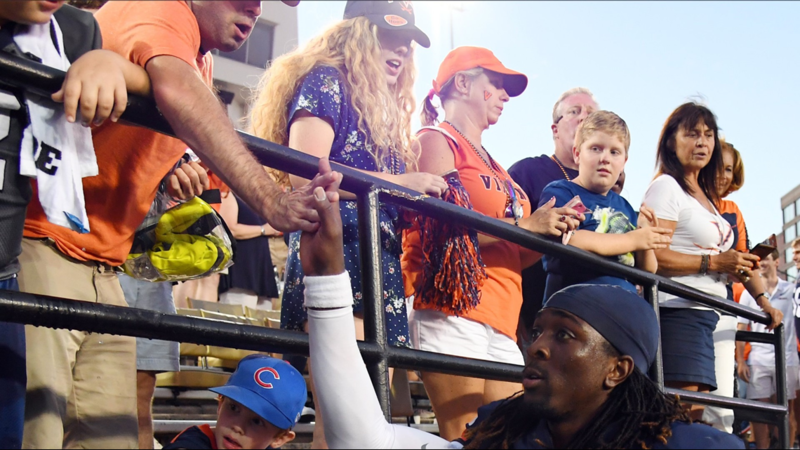 Zaccheaus' 77-yard touchdown reception with 6:01 to play was Bryce Perkins' third touchdown pass of the game. He completed 25 of 30 for 379 yards. The Cavaliers scored on their first two offensive plays of the game. 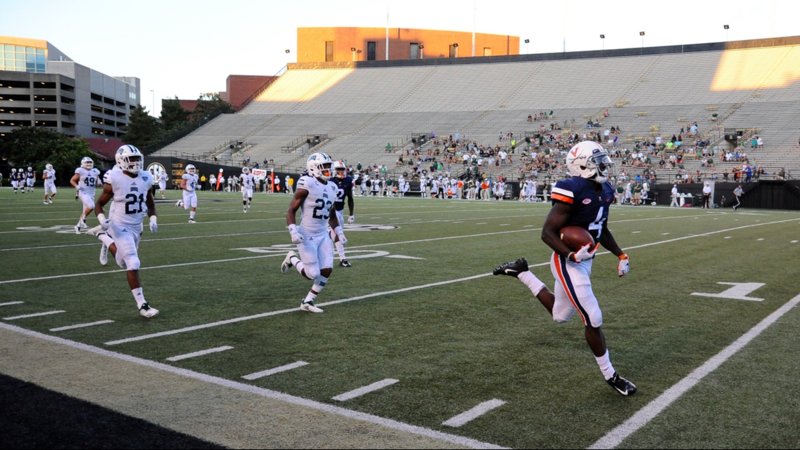 Ellis scored from 18 yards out following an Eli Hanback fumble recovery. 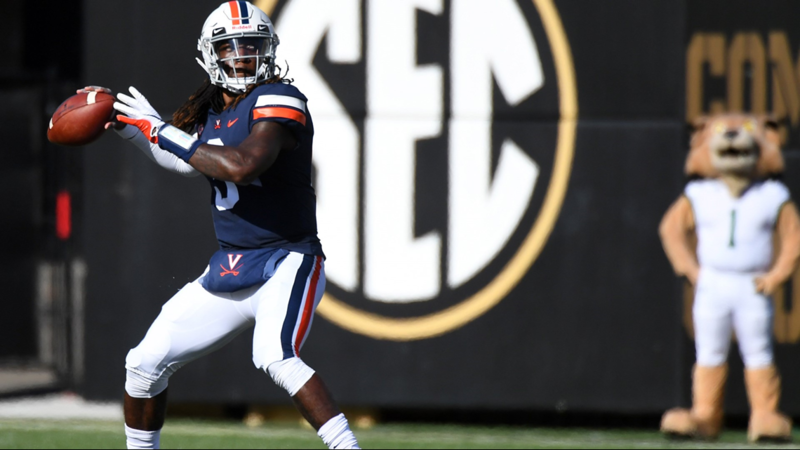 Following a three-and-out from the Cavalier defense, Virginia took possession on its own 14. 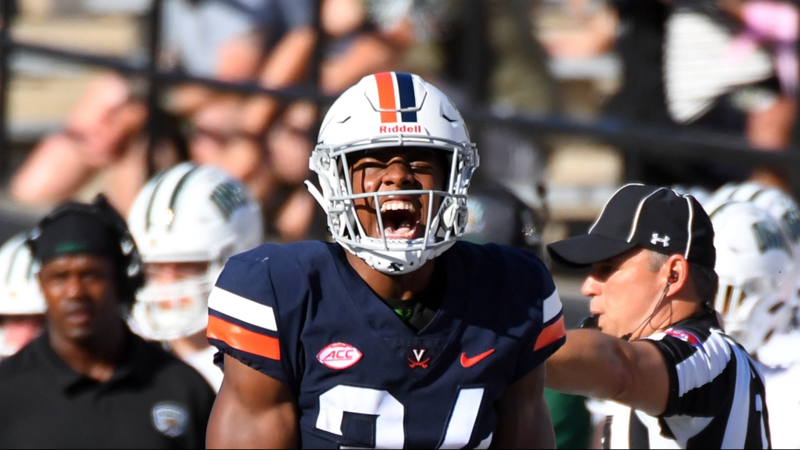 Perkins completed a short pass to Zaccheaus, who made a tackler miss along the right sideline and raced 86 yards for Virginia's second touchdown in a span of 1:21 and a quick 14-0 lead. "It was very big," Ellis said. "We wanted to come out and start fast. We wanted to start fast, but the thing we need to work on is keeping that up all throughout the game." Ohio (1-1) stayed in the game going 80 yards in five plays. 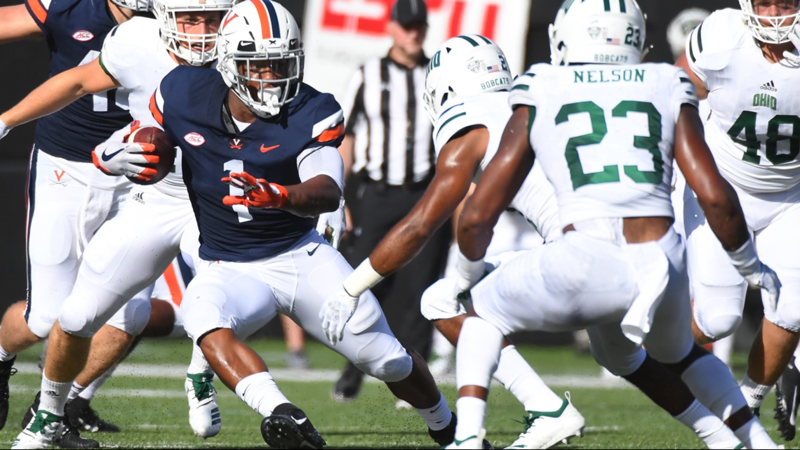 A 70-yard scramble by quarterback Nathan Rourke gave the Bobcats first-and-goal at the Cavaliers' 4, and Malek Irons scored two plays later from a yard out to cut the Virginia lead to 14-7. 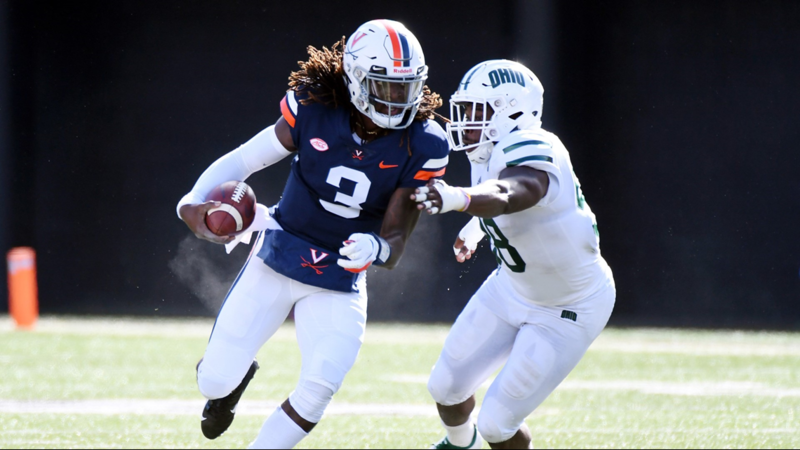 The Cavaliers went to work again, scoring three unanswered touchdowns, two from Ellis — a 75-yard touchdown run on the first play of Virginia's fourth possession and a 6-yard run that pushed the lead to 28-7. 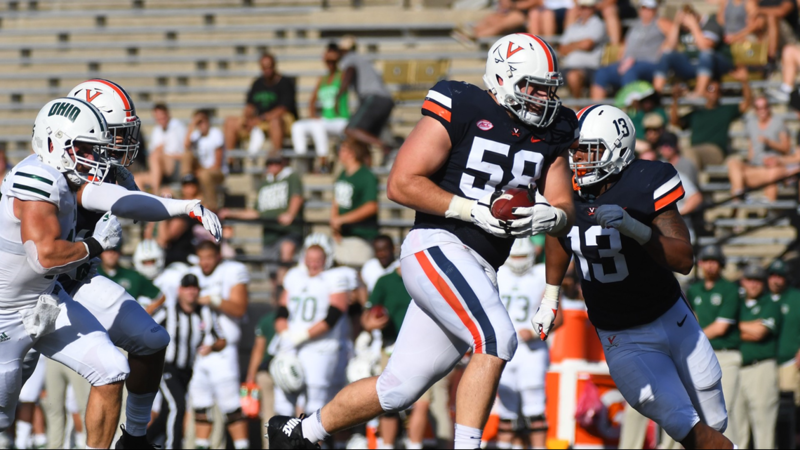 The Cavaliers took their biggest lead of the day when Perkins found Hasise Dubois for a 10-yard score to cap a nine-play, 44-yard drive wit 2:52 left in the first half. Ohio could get no closer than 10 points the rest of the way. 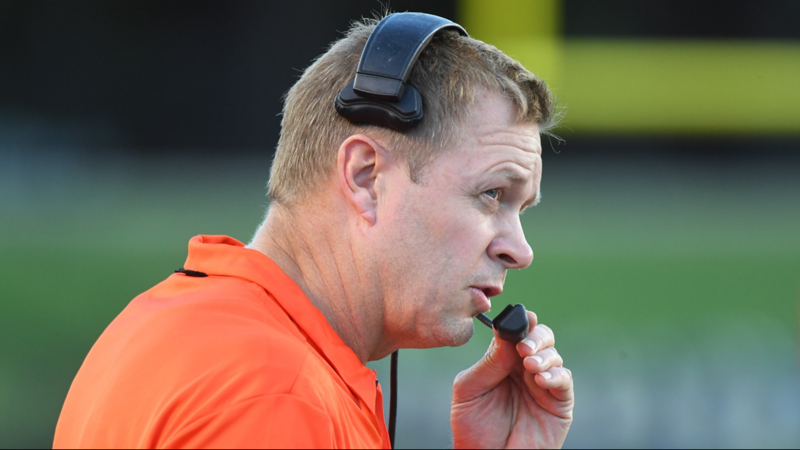 "We had a slow start and just did not play very good on either side of the ball at the beginning. 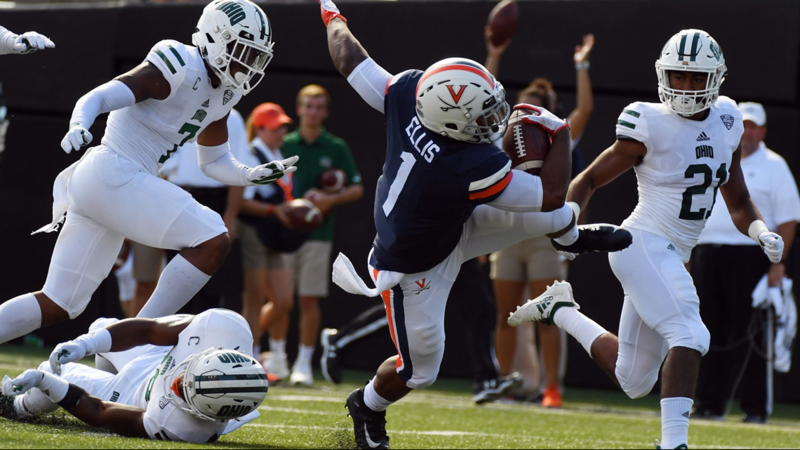 I thought we progressed on offense as the game went along," Ohio coach Frank Solich said. "We showed flashes at times defensively, but it wasn't nearly enough. The early part of the game was ridiculous in terms of the explosive plays that we gave up." 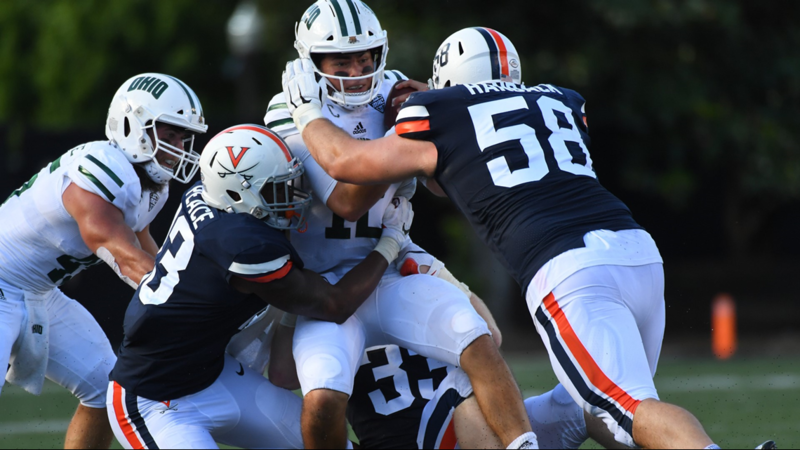 The Bobcats scored two touchdowns within a minute before halftime, as Rourke found Papi White for a 29-yard touchdown after a fumble recovery by Eric Popp. Popp then recovered an onside kick, which led to a 36-yard touchdown pass from Rourke to Papi White. 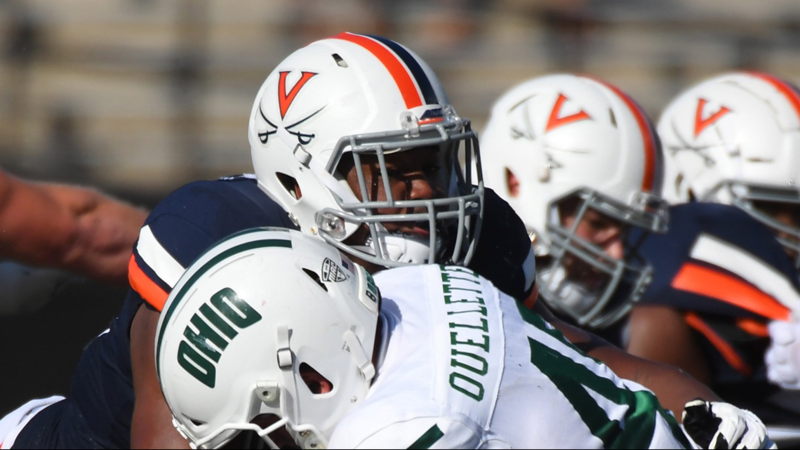 Virginia tacked on A.J. Mejia's 32-yard field goal to close out the first half scoring. 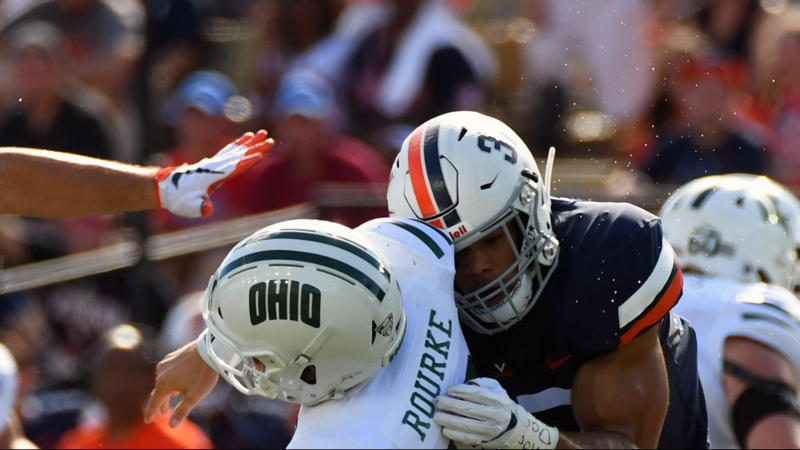 The scoring slowed in the third quarter, with Ohio getting the only points of the period, putting together a six-play, 80-yard drive with Irons scoring from a yard out to cut the Virginia lead to 38-28. 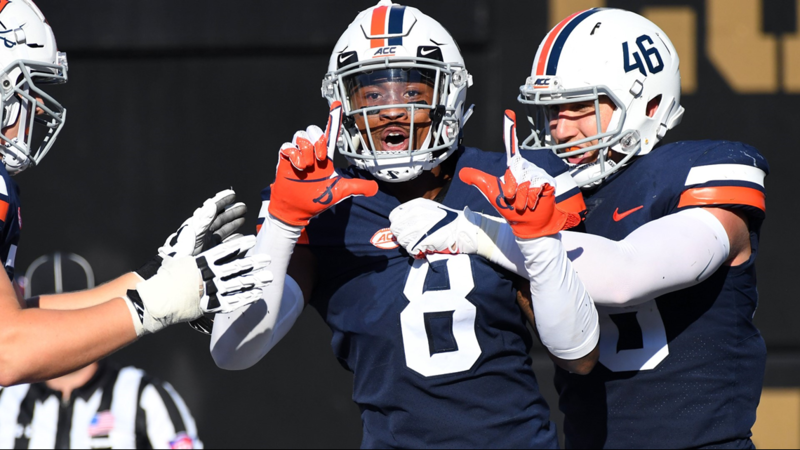 Virginia finally put the game away with the 77-yard, fourth-quarter touchdown pass from Perkins to Zaccheaus. Ohio's Louie Zervos made a 45-yard field goal with 2:59 left to account for the final margin.